I admit that I will love Allie forever, just because she likes my writing (Don’t judge me! 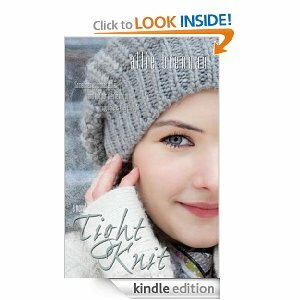 ), but I also read excerpts from Tight Knit on her blog and was totally hooked. While I am getting a paper copy of this as part of winning Allie’s contest, I had to buy it as soon as it was on Amazon. I loved it so much that it’s well worth having more than one copy! I loved the character development. Talia wasn’t a perfect goody goody. She has issues. Rather serious ones. I’ve had one panic attack in my whole life and hope never to repeat the experience. Talia lives with them multiple times a day. She’s terrified of living and she has to slowly learn that she’s got strength for days. I also appreciate that Talia doesn’t play the usual teenage girl games. Her experiences have given her a different outlook on life and that hidden strength shows when she speaks her mind. Even when she’s afraid to. Likewise, Lachlan isn’t all bad boy with a past. Oh he’s got a past, all right. And wow, is it a doozy. He’s struggling with it and his desire to be better. Turns out, he’s got hidden strength too. Also. I’m so learning to crochet Talia’s hats. Just saying. When I master them at last, I’ll send Allie one! It ended. *pout* That’s how I know I’ve read a good book. I’m always bummed at the end because I’m attached and want to keep watching the characters’ lives. I lost a lot of sleep over this too. I got it on a Friday and stayed up til 3:45am reading, cause I didn’t want to put it down. I was a total zombie the next day and A got to complain about me having the light on for once. So you see, everyone was happy. Seriously, buy and read this book. Allie is a great writer and it just makes you feel good when you’re finished reading it!